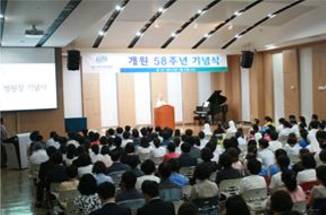 Daegu Fatima Hospital was established in 1956 with the goal of carrying on the Catholic Church's tradition of healing ministry in the spirit of Jesus Christ the Healer. We have been putting every effort into curing patients and providing them with a comfortable medical environment by introduction of new medical technologies., the latest medical equipment and modernization of hospital facilities. This was possible thanks to the many efforts of doctors, nurses, and staff members. "Daegu Fatima Hospital is making progress toward the world beyond Korea." 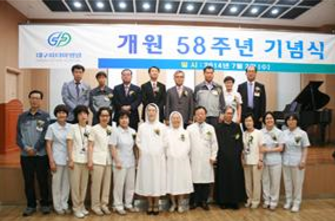 said CEO Sr. Jean Marie Chang in her speech at the ceremony of the 58th Anniversary of Daegu Fatima Hospital held at Link Hall on July 2, 2014. 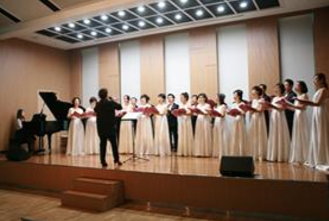 There were acknowledgements of outstanding members followed by a musical concert.